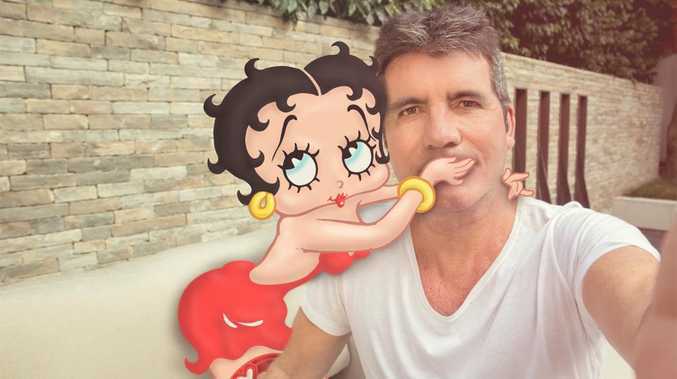 SIMON Cowell is making a Betty Boop movie. According to Variety, confirmed producers are Zareh Nalbandian and Jason Lust from Animal Logic - who were responsible for the animation on 'The Lego Movie' - and Cowell and Adam Milano from Syco. There is no director or writer attached to the project yet. Cowell confirmed the news on his Twitter account, writing: "I've worked with some serious divas but I think Betty could be the biggest of them all! @bettyboopnews (sic)"
The post was accompanied by a photo of 'The X Factor' judge being silenced by Betty, who had her hand over his mouth. Jazz flapper Betty made her first appearance in the black and white cartoon 'Dizzy Dishes' in 1930 and went on to feature in over 100 cartoons with her catchphrase "boop-oop-a-doop" becoming famous worldwide. The bobbed-hair, short-skirted character also made a cameo in the 1988 Disney hybrid film 'Who Framed Roger Rabbit'. Speaking about the deal, Mark Fleischer, chairman and CEO of Fleischer Studios, said: "I am delighted to partner with Syco Entertainment and Animal Logic. Their energy, creativity and playfulness make them a perfect fit for Betty Boop." The Betty Boop movie is Cowell's latest foray into films following the 'Pudsey the Dog' movie and Paul Potts biopic 'One Chance', which starred James Corden.